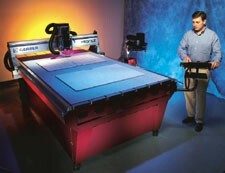 We are proud to announce we have added a new Gerber Profile to compliment our laser dieboard cutters. To uniquely offer both technologies we are able to provide our customers the best of both worlds. Each of these technologies (laser cutting & Gerber profile cutting) possess unique advantages over the other depending on the die required. Both feature extremely high tolerances which is paramount in our tradition of precision. This dual approach allows us to create the perfect die for every application. We pride our self in pioneering this dual approach to remain the Country’s premier Steel Rule Die manufacturer.